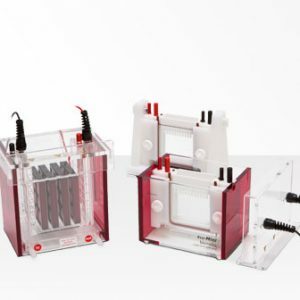 During electrophoresis the inner glass plate is in tight contact with the upper buffer reservoir for effi cient heat removal and smile-free runs. 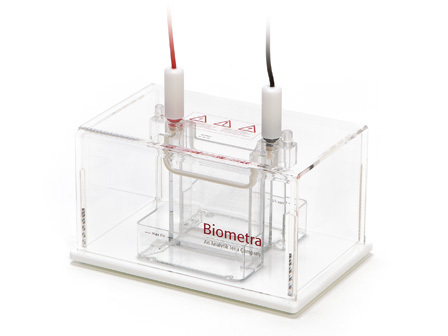 Twin-gel system with optimised design that allows separation of up to 56 samples in one run. One or two gel operation is possible. 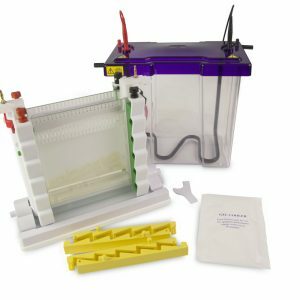 8 cm x 10 cm or 10 x 10 cm PAGE gels from most suppliers fit in Minigel-Twin. the casting of up to 5 single gels. 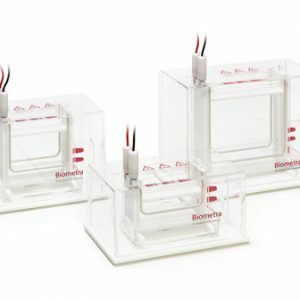 The special design of the housing allows easy tilting to bring the gel sandwiches to an angle of 45° for the pouring process. This allows the gel solution to run slowly along one side of the plate sandwich to avoid air bubbles. After pouring the gels the casting stand has to be turned back to bring the gel sandwiches into vertical position for polymerisation. In the Minigel Glass Plate Stand up to 6 separate glass plates or sets of glass plates for Minigel-Twin can be stored. Additional the Glass Plate Stand is the system of choice for drying of glass plates after cleaning. This stand is not designed for gel casting. 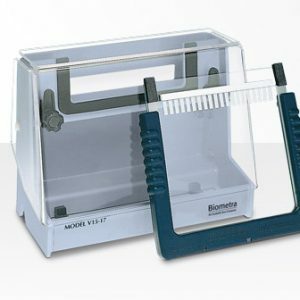 The Rotary Table for Twin-chambers allows easy sample loading by turning the whole chamber. The table fits to Minigel-Twin, Mini-V8.10, Eco-Mini family, Multigel and Multigel-Long.